This post was cross-posted from Spatial Collective’s blog. There are significant geographical disparities in production, composition and management of waste in the world, and even within cities. Informal settlements all over the world lack proper waste management systems, leaving people to live, literally, in waste. 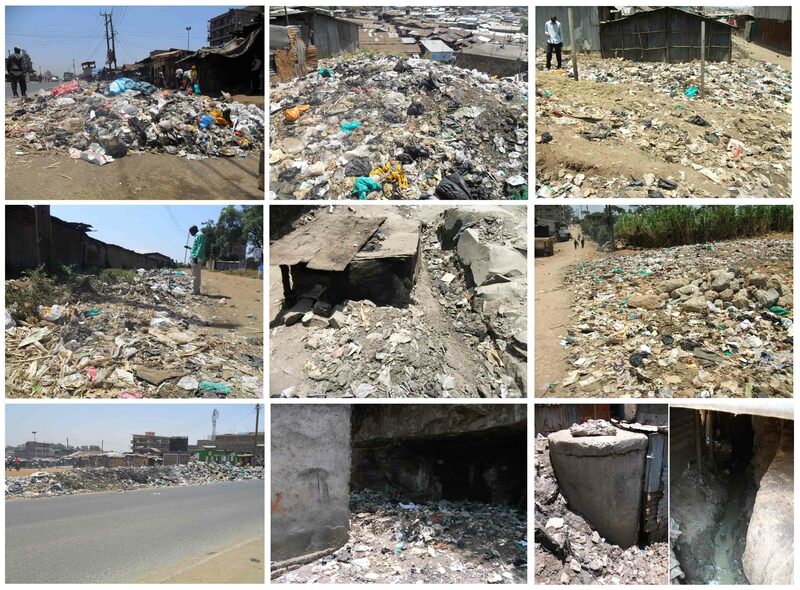 Waste management in Mathare, an informal settlement in Nairobi, is problematic to say the least. Waste is everywhere, and so are the efforts to clean it up, as I have discussed in previous posts. Informal dump sites and waste management initiatives come in all shapes and sizes. As a part of Spatial Collective’s waste management campaign we aim to document the extent of waste dumping and other waste related activities in Mathare. While mapping stakeholders (youth groups, local administration, and middlemen) and amenities (toilets and water points) is relatively easy, a problem arises when we try to document the extent of waste dumping in the community. Waste is only marginally space bound (meaning left at a certain location) and is more often scattered around – people either throw it wherever they want or wind and rain move it around the community. Despite these challenges, we designed a coding scheme to help us determine the extent of waste lying around in the community. We believe that the coding scheme can help us address some of the challenges that come with trying to document community’s dumping of waste. One of the main challenges we face is how to document the size and content of all the various dumps sites; how do we decide which pile of waste is important enough to be mapped? We believed that if we were to leave it to community members to map whatever each decided to map we would end up with an unequal representation of the distribution of garbage (health hazards). Because each person perceives his or her environment in different ways, what is important to one person might not be to the other. If we want to monitor and document the effects of interventions, variance of this sort is not acceptable. We realized we needed a clear and well-structured categorization of waste, one that captured related issues that cut across communities. Only then could we perform comparisons and, hopefully, detect changes over time. Our initial coding scheme consisted of about a dozen categories, ranging from different types of illegal dump sites to official collection points, toilets and water points, and various stakeholders – youth groups, government officials, and business entrepreneurs. We tried to make the categories mutually exclusive, with each capturing some essential quality to particular waste types. After completing the coding scheme, we conducted an inter-coder (mapper) reliability test. Inter-coder reliability refers to the extent to which two or more independent coders – in our case mappers – agree on the coding of the content of interest with an application of the same coding scheme. For the purpose of testing our coding scheme we determined the footpath that each mapper would take at a different time intervals (about 15 minutes apart). The mappers followed the assigned path and mapped according to the coding scheme. The results were more or less surprising. We believe that a combination of a bad coding scheme together with (our) lack of awareness of what the actual hazards of waste are and ubiquitous nature of the problem contributed to these results. We drastically improved and simplified the coding scheme to see whether a new and improved code will give us better results. 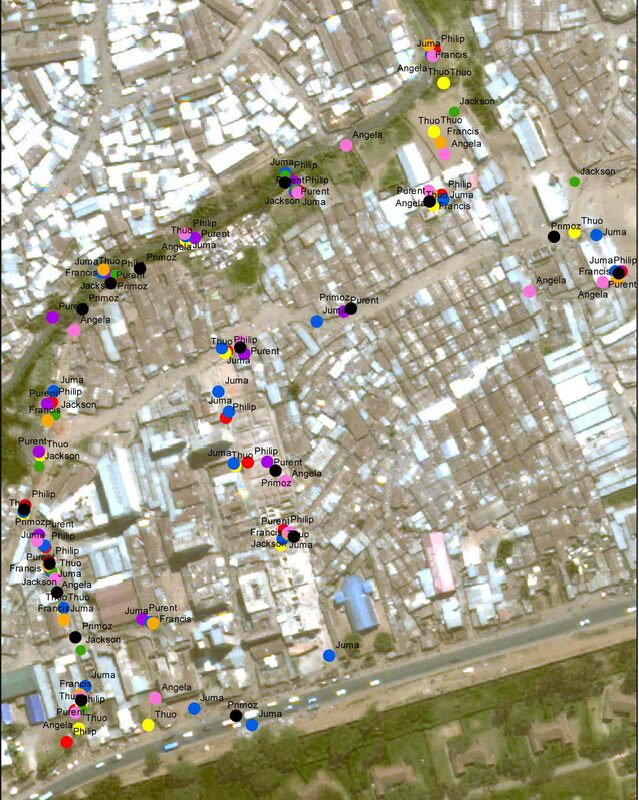 Documenting the extent of informal dumping and mapping stakeholders is just one in a series of measurements we executed trying to determine how governance around waste management occurs in the current setting. We hope that additional quantitative and qualitative methodologies we put in place will provide us with a clearer understanding of waste management in Mathare and with a clear way forward towards various hazard mitigation initiatives. In the end, we need to consider the following: Managing solid waste well and in the most economically, socially, and environmentally optimal manner possible is one of the key challenges of the 21st century. Waste management is primarily a public health and an environmental issue. In a place like Mathare, where waste is everywhere, and where a single item lying on the ground can be harmful to a child or a human, we raise an important question: how much can we actually rely on the citizens to provide us with an exact picture of the hazards within their community? Our survey shows that 98% of the people surveyed believe that waste lying around is harmful to the community members. And while they know that waste and human feces are dangerous, do they know exactly how dangerous they are? When a small, and in the eye of a community member, insignificant pile of very toxic trash can be far more dangerous than a huge pile of paper and plastic, can we rely on the citizens to provide us with a good representation of the hazards within the community? How well are they actually equipped to understand and document the extent of these hazards? These are some of the questions that we will have to think about and work on in the near future in order to validate our datasets.